Don't Get Shocked... Keep The Panel Locked! 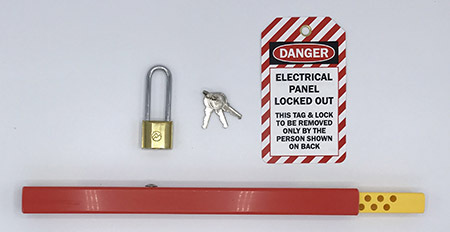 The Panel Lockout is an electrical lockout tagout device used to lock out circuit breakers by locking out the entire electrical panel. It attaches to the panel cover screws and keeps the panel door locked. The device encapsulates two screws which prevents the panel cover from being removed. The circuit breakers remain locked out while work is being done. No worries about what size or type circuit breaker needs to be locked out. No need for multiple locks to lock out more than one breaker. The Panel Lockout comes with a brass padlock and reusable tagout. Order direct from our USA factory and save! No screws on your panel? Please check out our plastic Clips for panels without screws in our web store. 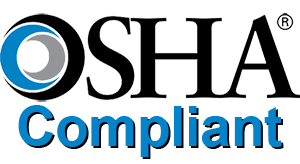 Please also visit out Lockout Tagout FAQ’s page for Clip installation instructions. The Panel Lockout can also be used to prevent accidental shutdowns of critical equipment. It stops unauthorized persons from accessing electrical circuit breaker panels, security panels and data center panels. Don’t Get Shocked… Keep The Panel Locked! 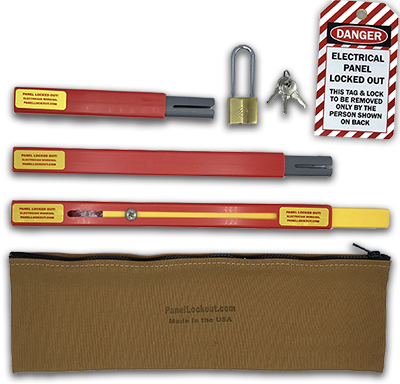 The Panel Lockout is only 13 inches long when retracted and fits in a tool bag. It can be used on panels 14 inches to 20 inches wide. With available extensions it can protect panels up to 37 inches wide. It is constructed of sturdy, non-conductive plastic and installs in seconds. The price for the Panel Lockout is only $39.99. A polished brass padlock with 3 keys, and a reusable tag out are included. Quantity discounts are available and are automatically calculated in our web store. The Electrical Panel Lockout tagout device is more secure and versatile than those little red circuit breaker lockouts. For instance, it can lock out several breakers with one lock. In addition, the panel door is locked closed with the Panel Lockout. However, the panel door remains ajar with the red circuit breaker lockouts. The Panel Lockout is universal for most panels but circuit breaker lockouts require a different type for each kind of breaker. The Panel Lockout was developed by a Local # 3, IBEW electrician with 35 years of field experience.